Each BLOX Racing billet vacuum manifold kit is a great addition for enthusiasts and tuners that require additional vacuum sources. Each vacuum manifold is CNC-machined from AL6061 and features six functional 1/8” NPT vacuum ports. This is an easy and ideal method to tie in a boost controller and gauges, and any other components that require a separate vacuum source. 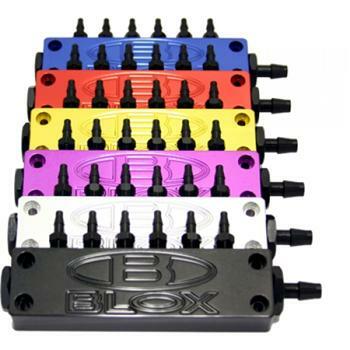 BLOX Racing surface-mount vacuum blocks provide a single point for additional vacuum needs. They easily mount anywhere on a flat surface. Surface-mount vacuum blocks also mount on top of BLOX Racing Version 3 intake manifolds for the B-series engines.